Falcons News · Apr 10 Isabella Gulbranson Earns AZ Central Player of the Week Honors! 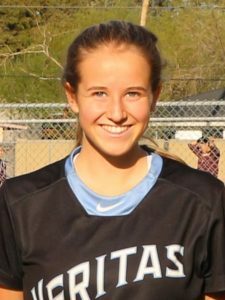 Veritas Prep’s very own Isabella Gulbranson was chosen as the high school female athlete of the week by AZCenteral.com for the week of March 30th-April 5th! As a freshman, Isabella has been a key contributor to both our soccer and softball programs. This season she is batting .680 as she leads the way for the Falcon offense.